Check your calendar for March 22-24. Do you need some summer vibes to cope with the cold winter weather? Join me as we stitch this fabulously fun, colorful, happy canvas by lulu mypinkturtle! Who doesn’t love a flamingo wearing pearls? 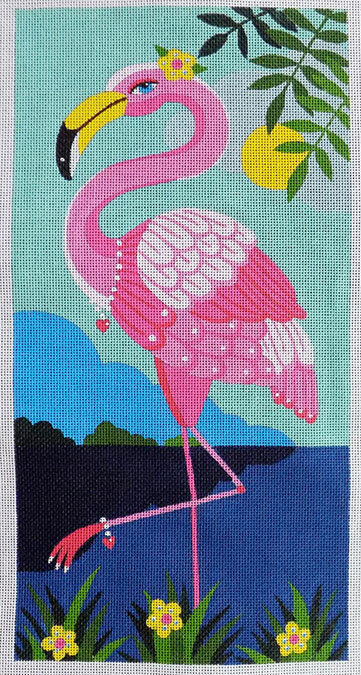 I see lots of sparkle and fun open stitches in the background so that the flamingo really pops. Join us for three fun days of stitching and fun. I will have a complete stitch guide ready for you and we will spend our time stitching and watching the canvas come to life. Design size is 7 x 14 handpainted on 18ct. Further details are on the website. Click here. Give us a call at 410.296.0405 to sign up, or to order a kit. « Previous: Let’s do the Twist! I can’t wait!! So cute!